Prevent Gingivitis & Gum Disease! Why OC Dental Center for Your Teeth Cleaning? 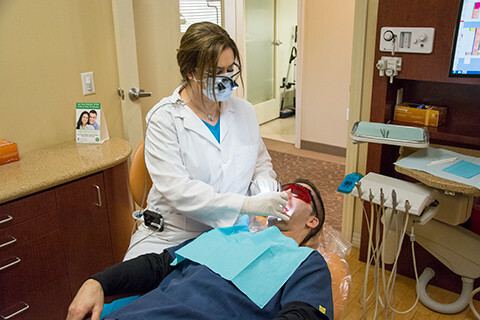 For over 20 years now, OC Dental Center has been preventing major dental problems from happening to our patients through our professional teeth cleaning procedures. We use gentle and advanced methods with the best hi-tech equipment to ensure a successful, pain-free teeth cleaning. We recommend that our patients schedule a bi-annual teeth and gums exam with us along with a professional teeth cleaning. The best solution to most dental issues is to prevent the issue from happening in the first place. In many cases, simply keeping up with regular teeth cleanings along with good dental hygiene habits such as brushing and flossing regularly can keep yourself from having to deal with large dental problems in the future. During our exams we are able to catch any small signs of dental challenges arising and stop them easily. Sometimes we may recommend periodontal deep cleaning for your dental cleaning in advanced cases. Floss to Removal Plaque - First, we floss your teeth to remove any plaque in your teeth. Tartar Removal - Tartar is basically plaque that has hardened. It cannot be removed by simple flossing or brushing. If not treated, long term effects of too much plaque buildup are gingivitis, halitosis (bad breath), and in severe cases periodontal gum disease. We use delicate utensils to gently remove harmful tartar from your teeth. Teeth Washing and Polishing - After we have removed the plaque and tartar from your teeth, we will wash, rinse, and put a nice polishing agent on your teeth to give your smile an extra shine.